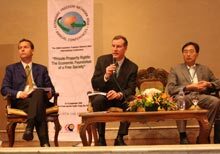 To mark the 10th anniversary of the Economic Freedom Network (EFN) Asia, the Network decided to return to its Philippine beginnings by holding its ninth conference on 18-19 September 2008 at the University of Asia and the Pacific, Pasig City. Choosing “Private Property Rights: The Economic Foundation of a Free Society" as its theme, EFN Asia linked up with the Friedrich Naumann Foundation for Liberty (FNF), Center for Research and Communication, the Philippine Economic Society, the Foundation for Economic Freedom and the School of Economics University of Asia and the Pacific for this event. Over 200 international and local participants from civil society, government and academia gathered at the university for two days to listen to both foreign and resident experts address: legal and economic perspectives, acquisition of property by the state, significance of property rights in the Economic Freedom of the World index and challenges to property rights in Asia. Of particular noteworthiness within the Philippine context were the presentations by: i) Arsenio Balisacan, who gave a sobering assessment of the decidedly limited success of the Agrarian Reform Program in the Philippines, ii) Arturo Corpuz who looked into restrictions on land use and iii) Gamaliel Pascual who presented a fascinating overview of the serious problems in land title administration in the country and a successful reform project in Cebu city. 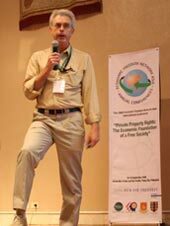 These presentations were put into a wider context by international participants like Dr. James Riddell who looked at the anthropology of property rights, Barun Mitra from India who took a social perspective on property rights, and Dr. Mark Mullins from the Fraser Institute who looked at property rights in the context of economic freedom. 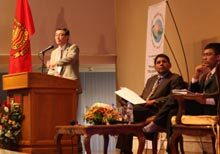 Presentations from other Asian countries dealt these with specific issues from their respective property rights challenges. What started as the Foundation’s desire to widen the exposure of the Economic Freedom of the World reports in the region led to an original partnership with the Fraser Institute, the Center for Research and Communication and the Atlas Economic Research Foundation. Together they organized the first conference in Manila in 1998 on economic freedom in Asia. This endeavor has grown into a network that now boasts think tanks, research institutes and individuals from more than 20 Asian countries. It works towards further developing the use of the Economic Freedom of the World index in Asia and exploring specific areas of economic freedom to gain a deeper understanding on how to advance specific reforms.